So have you heard of Lazada? 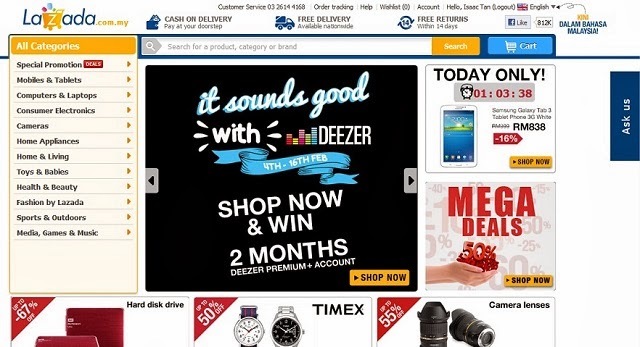 Touted to be Southeast Asia's biggest online shopping mall, I was introduced to Lazada.com.my recently. Now I've always been on the look out for a suitable thermometer for Baby Martin, ever since he came down with fever a couple of times over the past 1 year or so. As he is still young, I've been looking for one which requires no contact, with just a press of a button it can measure the temperature from Baby Martin's forehead. Registering myself on Lazada.com.my was a breeze, and within minutes I was already a happy browser of their thousand and one items. Yes, they have such an extensive array of items on the site, ranging from tech gadgets, computers, laptops, cameras, home appliances, baby products, fashion, and even media, games and music. A few mouse clicks and keyboard entry later, I found exactly what I was looking for, at a bargain price of below RM100 at that point of time. Lazada.com.my's search function was indeed powerful, bringing up relevant and exact search results which made my search a lot faster than what I expected. Introducing the Bremed BD1500 No Contact Forehead Thermometer, one which hopefully can be put to good use if ever the need arises. One thing I would like to commend on Lazada would be the speed of the item being sent direct to my house doorstep. 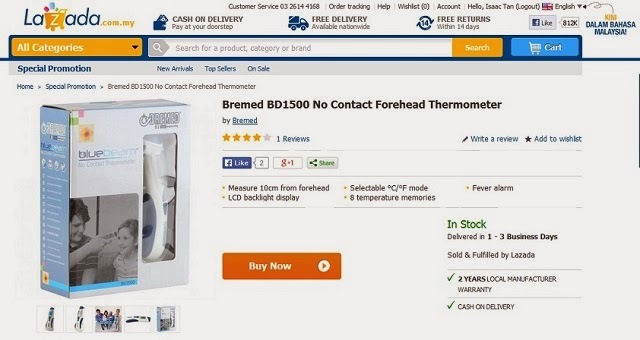 If in stock, the recommended shipping time is 1-3 days, and true to their word, the Bremed BD1500 No Contact Forehead Thermometer arrived within two days upon order confirmation. A quick overview on the functions of the Bremed BD1500 No Contact Forehead Thermometer is in order so check out the key features listed below. Just point the Bremed BD1500 about 10cm from your forehead and its smart ray will instantly measures your body temperature in a snap! This smart digital thermometer can even save up to 8 memories of previous reading for easy reference. The Bremed BD1500 truly comes in handy when your toddler is fussy and moody with fever. This digital thermometer truly cares for your whole family's health. This mini health monitor can easily fit into the palm of your hand. The Bremed BD1500 has a soft touch material for easy grip. The smart digital thermometer even has a battery level indication for your convenience. During standby mode, your Bremed BD1500 will automatically display the room current temperature. In fact, you can even point this thermometer to get your baby bottle temperature reading! So, get this smart thermometer to watch over your beloved family today! So what happened when I tried to test out the functions of the no contact thermometer on Baby Martin? It was a simple step of pointing the device 10cm away from his forehead and pressing a button. Glad to say it worked well, however after a couple of times pointing it at his forehead, Baby Martin gave me the 'hand'! Hey, stop pointing that thing at my forehead Daddy! Sorry for the image quality, as it was taken from my ancient iPhone. Anyway coming back to the online shopping site Lazada.com.my, I would recommend it to anybody looking out for a bargain on any items they are looking for. In fact, I actually found my 100ml CK One perfume going for less than RM100. However be mindful, the price actually fluctuates according to the current promotion at Lazada.com.my. Well, if you haven't yet, head on now to Lazada.com.my and register an account today! Online shopping has never been easier, with most items going for a cheaper price than what I expect. In fact, it has become one of my habit to do a quick check on what are the good bargains on Lazada before I actually head out to the shopping malls to purchase anything. Lazada (http://www.lazada.com.my) is Malaysia's largest online shopping mall and is pioneering e-commerce by providing a fast, convenient and secure online shopping experience combined with an extensive product offering in categories ranging from mobiles & tablets and consumer electronics to household goods, toys, fashion and sports equipment. Lazada is continuously striving to offer its customers the best possible shopping experience with multiple payment methods including cash on delivery, extensive warranty commitments and free returns. Good! Good! Must get one. Mustn't let fever run high, if any, may lead to ill consequences. Go see doctor quickly as and when necessary. That's a great price for a good thermometer.